The Mayo Clinic, a non-profit academic medical center based in Rochester, Minnesota, implemented additive manufacturing into its pre-surgical planning processes over ten years ago. Now, with several successful cases, Dr. Jonathan Morris, Co-Director of the Anatomical Modeling Laboratory and Neuroradiologist at the Mayo Clinic, reflected on the positive impact 3D printed anatomical models have had in addressing unique and complex surgeries. “3D Printing bridges this gap of taking the unknown and making it known,” said Dr. Morris in a keynote speech at the Materialise World Summit, in Brussels, Belgium. Founded over 150 years ago, the Mayo Clinic, which maintains three campuses across the U.S., treats an estimated 1.3 million patients from 135 countries each year. Within its annual patient treatments, approximately 76,000 surgeries are performed. Among the vast amount of surgical cases, in 2008, Dr. Christopher Moir, Pediatric Surgeon at the Mayo Clinic, was confronted with five-month-old conjoined twins that were fused at the chest. Considering the unusual nature of this case, Dr. Moir and his surgical team sought out Dr. Morris, who had previous 3D printing experience from his time at the National Institutes of Health (NIH), to create customized anatomical models of the twins’ shared organs and rib cage. Following the successful surgical separation of the five-month-old conjoined twins and an influx of similar cases, Dr. Morris and Dr. Jane Matsumoto, Radiologist at the Mayo Clinic, established the Anatomical Modeling Lab. 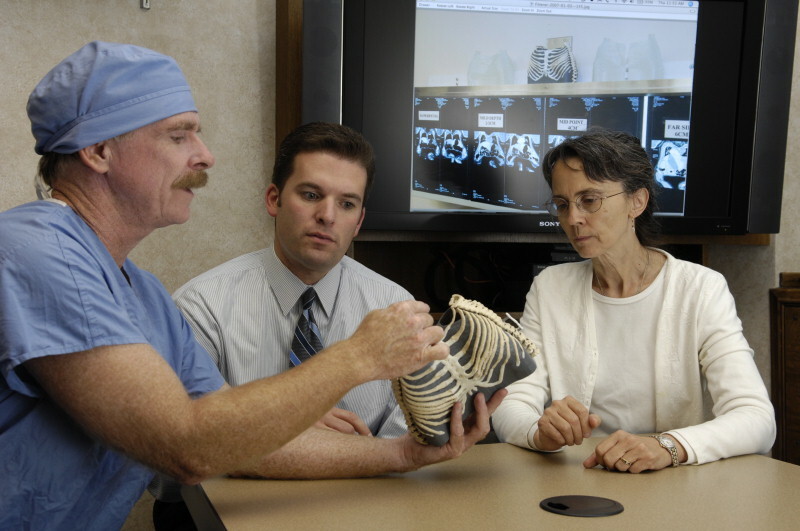 Dr. Jane Matsumoto (right), co-director of the Anatomic Modeling Lab, with Dr. Christopher Moir, (left), using models to plan the separation of conjoined twins. Photo via the Mayo Clinic. Offering clinical 3D printing services to its three U.S. campuses was not an easy task, explained Dr. Morris. Thus, members of the lab set up a validation workflow, including an ordering system, CAD software (i.e the Materialise Mimics Innovation Suite), and 3D printing systems within Mayo Clinic Operating Rooms (OR). Over the past few years, companies and medical facilities have been integrating additive manufacturing technologies for 3D printing labs within hospitals. Stratasys began installing its Mojo Desktop 3D Printer in five Veterans Affairs (VA) hospitals throughout the U.S. Following this, 3D LifePrints raised £500,000 in Series A funding to expand its medical 3D printing manufacturing operations international level. With such developments, experienced surgeons and emerging medical practitioners can use 3D printed anatomical models as an education tool within unique and complicated surgical procedures. 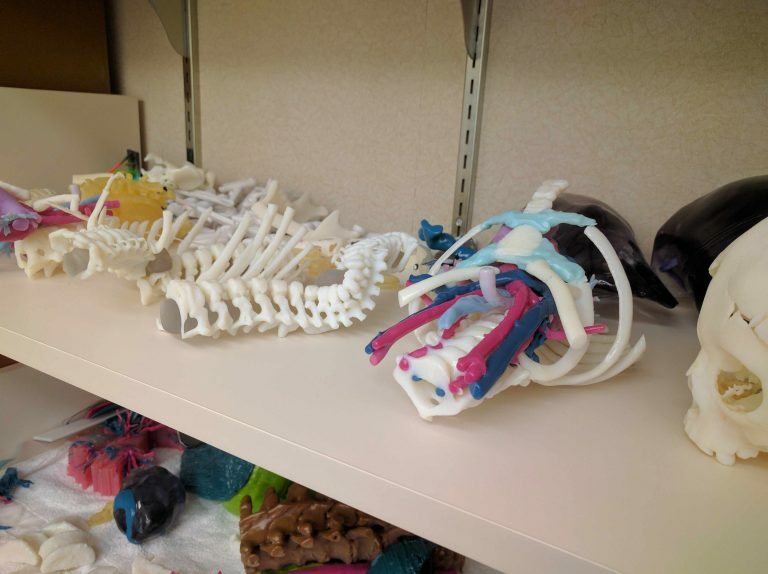 A collection of 3D printed anatomical models at the Anatomical Modeling Laboratory. Photo via the Mayo Clinic. Catch up with the latest news in 3D printing by subscribing to the 3D Printing Industry newsletter. Also, follow us on Twitter, and like us on Facebook. Seeking a new position in the additive manufacturing industry? Search and post 3D Printing Jobs for opportunities and new talent across engineering, marketing, sales and more. Featured image shows Dr. Jonathan Morris giving his keynote presentation at the Materialise World Summit, in Brussels, Belgium. Photo via Materialise.